I fell in love with Thai cooking on a visit there many years ago, and took copious notes of everything that I ate. Once home I set about recreating the dishes that I had enjoyed while there. I started by buying in the curry pastes, but now that I grow all the essential ingredients on the farm, I make my own, and I am not sure that I could now go back to the bought ones. The difference is the freshness of the taste, that if you do not over process you can have texture to the paste, and also of course that you can balance the proportions of the ingredients depending on how spicy you require it to be. 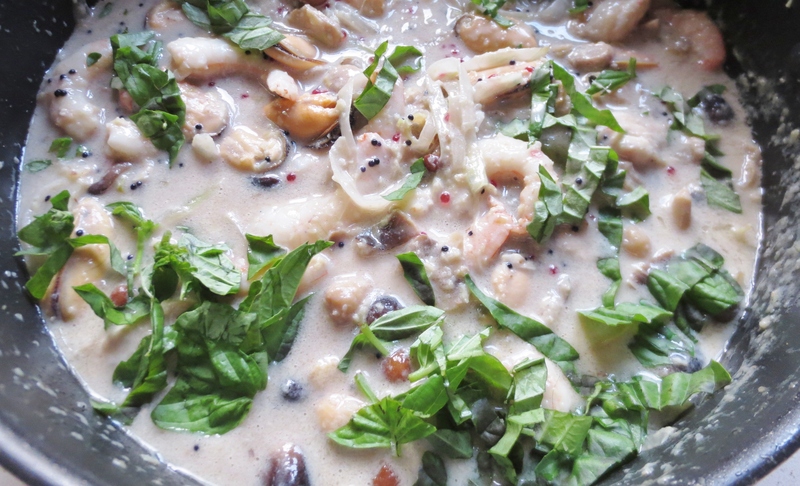 For a seafood curry, I like spice, but not overpoweringly so, but I still want a good strong flavour of ginger, garlic and lemon grass, so I put with them a milder pale green chilli which still has spice together with a good pepper flavour. Roughly chop the garlic and pound to a pulp in a mortar. Take the outer leaves off the lemon grass and cut off the tough base. Finely slice the tender part at the base, usually you get about 2 cm of tender part. Scrape the skin off the ginger and grate into the mortar with the garlic and lemon grass. Mash with the pestle until a paste adding the fish sauce as you go along. This paste can be made in advance and be left developing its flavours in the fridge until needed. Peel and slice the onion. In a pan big enough to take the curry, soften the onions in oil. Add the curry paste and fry for a few minutes. Add the coconut milk and stir well to mix in. Bring to a simmer and start adding the fish. Keep the curry on a low heat while the fish cooks to ensure that it doesn’t overcook. The white fish wants to be cut into chunks. If you think that all the fish requires the same amount of cooking, you can add it all in one go. The fish shouldn’t need more than five minutes to cook. Lastly add the fish eggs. I had assumed before putting these in hot dishes that they would melt into the sauce, but they don’t and so add colour and texture to fish dishes. They look particularly effective on Salmon with pasta. Garnish with the chopped herbs and serve with plain boiled rice. This is adapted from a recipe in Sri Owens fabulous book of Indonesian recipes. I would not call this a fixed recipe as I use whatever is fresh in the vegetable garden. If I plan ahead enough, I get some beansprouts sprouting a few days in advance. They are not available to buy fresh here in Spain, so you have to grow your own. If you cannot get fresh ones, miss them out rather than use the cooked ones that come in jars, the flavour and texture are just not the same. 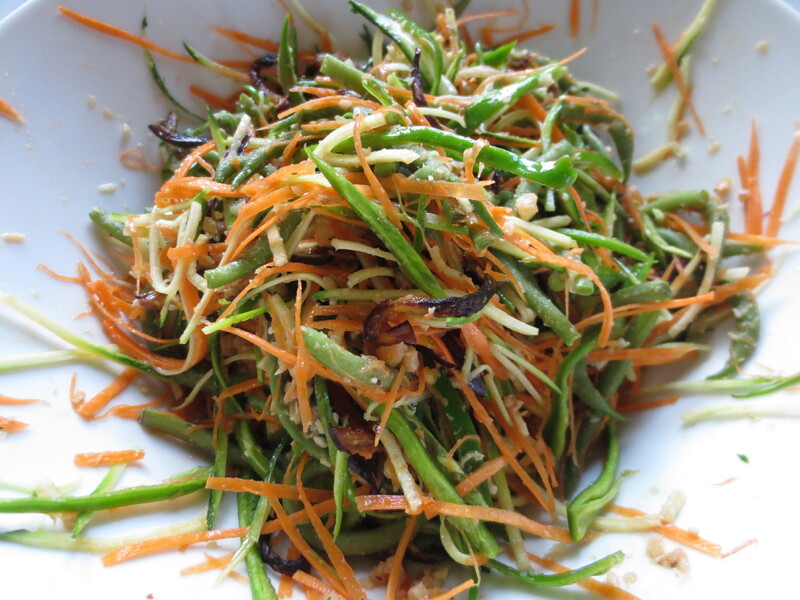 Put all the prepared vegetables in a dish with the herbs and mix together. Prepare the dressing. In a mortar pound all the ingredients except the lime juice until a rough paste with the nuts still having some bigger bits for texture. Add the lime juice and mix. Add just enough water to make into a sauce. Pour over the salad and mix well. Serve at room temperature. The beetroot grow so fast on the farm here that, throughout the summer, they are tender and tasty. I love them just grated as a salad with a dressing of Balsamic Vinegar and Olive Oil and some cubes of goats cheese on top. When I tire of that, then a lovely light soup is a great dish to make with them. Delicious chilled or hot. Peel the beetroot and chop into small dice. Put the beets and the garlic in a saucepan with the olive oil and fry gently to soften for about ten minutes. Add the chicken stock, balsamic vinegar and half a teaspoon of salt. 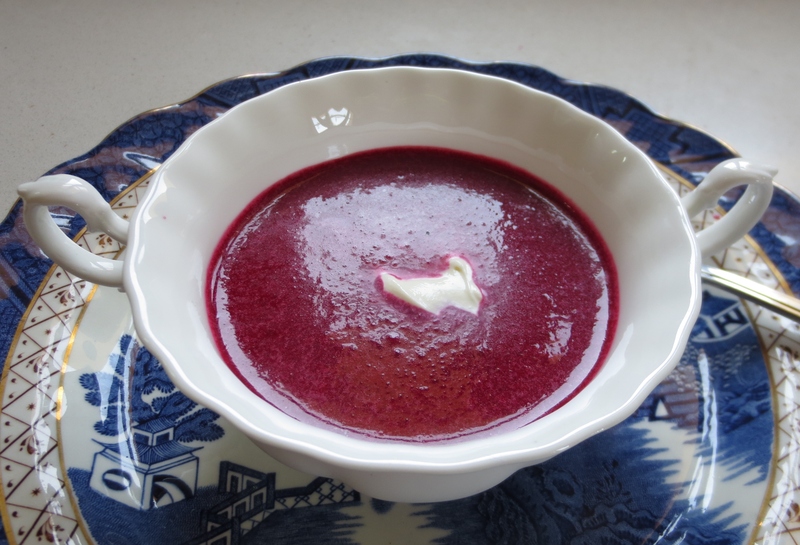 Bring to a simmer and cook until the beetroot is tender. Leave to cool. Puree in the food processor or liquidiser. Check the seasoning. Served either chilled or reheated adding a spoon of sour cream. At this sultry time of year I like to have a jug of soup chilling in the fridge. Solid food is too much in the August heat, and soup can be breakfast. lunch or dinner. 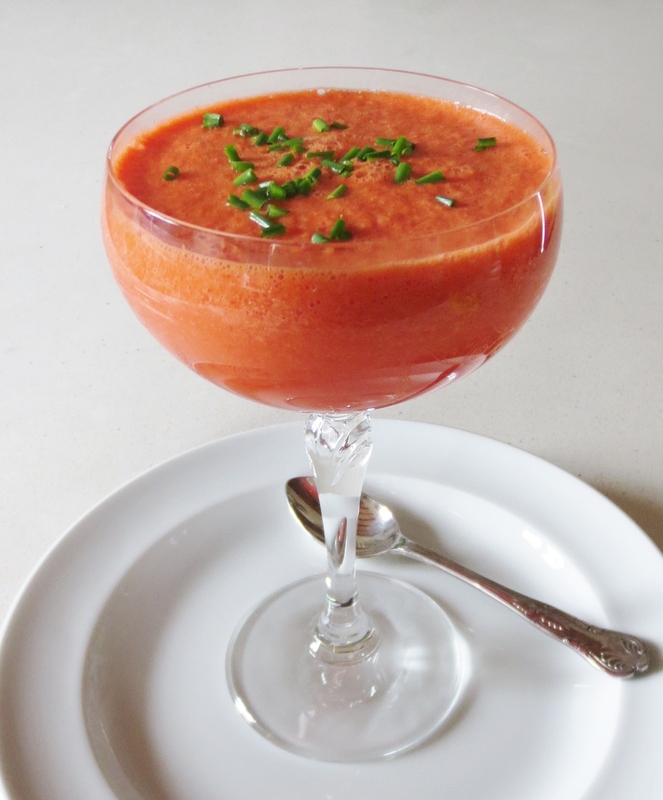 When I first came to Spain I quickly found out how to make the classic Gazpacho which uses the richly ripe summer tomatoes, peppers and cucumbers blended with sweet garlic and olive oil. Then in Cordoba I came across Ajo Blanco, made with the new crop almonds and deliciously creamy. 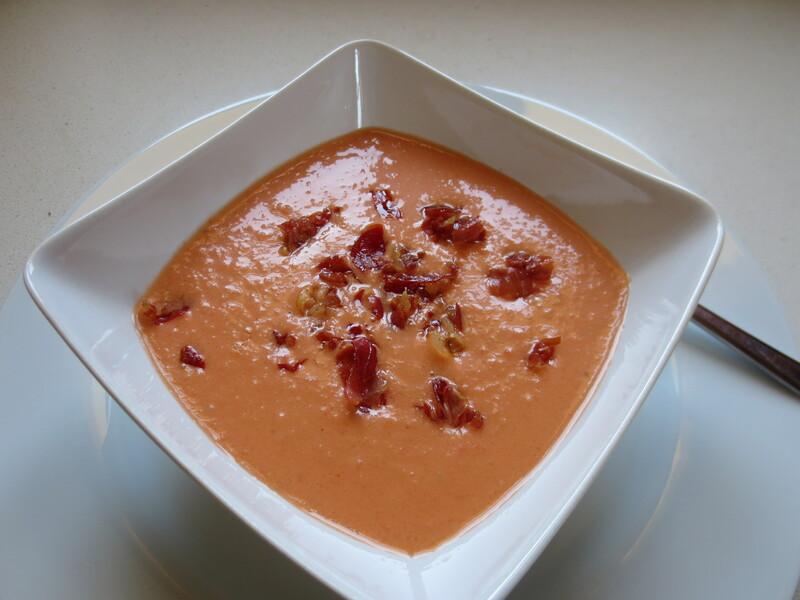 Some time later it occurred to me that these soups follow a sort of formula and maybe other vegetables – and fruits could be used to make Gazpacho. It all started with a bumper crop of slightly too acidic Loquats or Nispero and a vague memory of being served a fruit soup in Hungary while visiting a friends family there with her. The soup was delicious. Since then I have made soup from almost each fruit as they come into season. Cherries are particularly successful. I have used the flat white peaches that we grow on the farm, which make for a very creamy textured soup of the gorgeous delicate peach colour illustrated below. Nectarines, Plums, Apricots – all good. 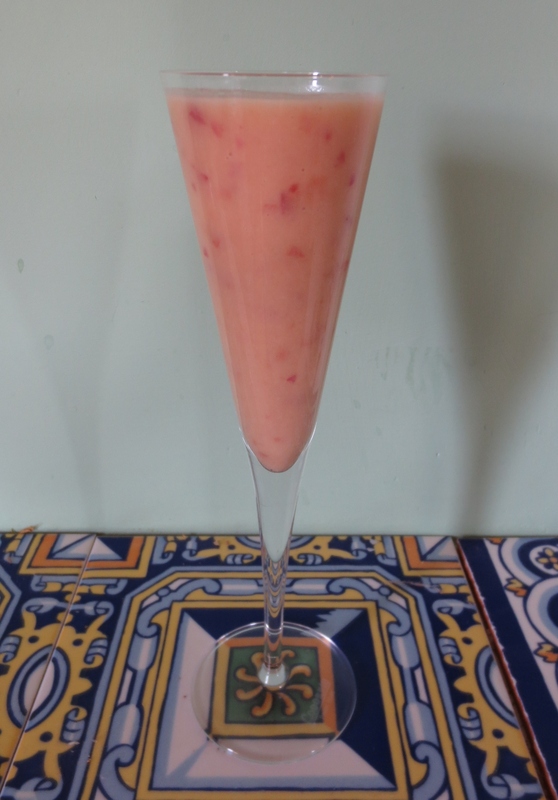 Right now Watermelon is the fruit, so I have used that for the master recipe. Now that the melons come without seeds that you need to pick out, it is even quicker to make. 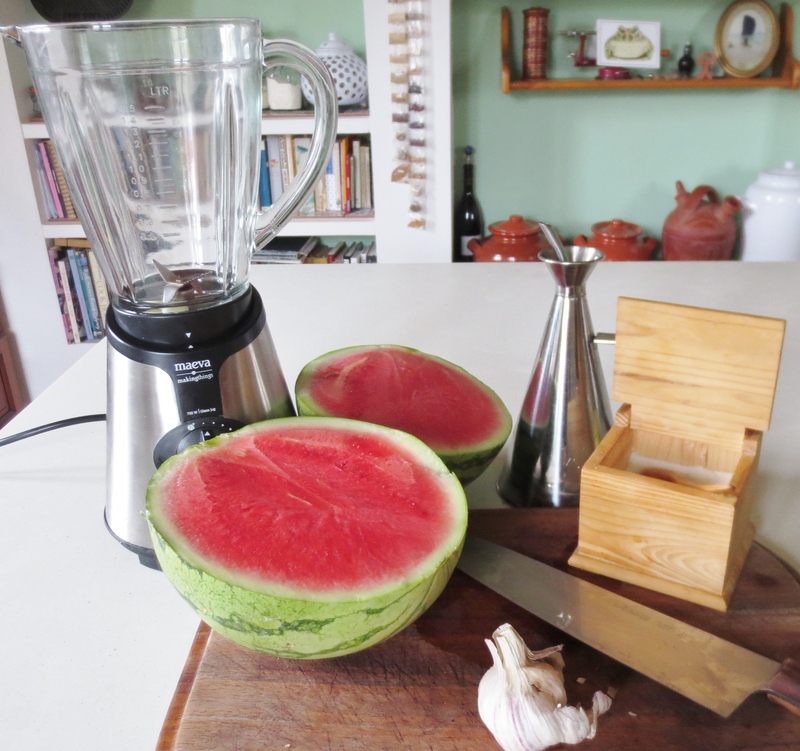 Simply cut the flesh from the melon into cubes, peel and roughly chop the garlic and then add these with the rest of the ingredients to the food processor or liquidiser and blitz to a puree. Check the seasoning and then put in the fridge for a couple of hours to chill down and for the flavours to meld. If you are using a more solid fruit like peaches or plums, you will need to add water to get the right consistency. Some fruits that are very sweet or very ripe benefit from the addition of lemon juice to balance the flavour. Have fun experimenting with your fruits. I always smile when I see beautiful pictures of pristine white sofas on outdoor terraces in design magazines. Those of you who live in the cool north imagine that we in the south live the majority of the time outdoors with no real line between the outside and inside living space. While to a large extent this is true, the line between the in and the out has to be more marked than you imagine, particularly if you live in the countryside. The problem is that the creatures amongst whom I have decided to live quite like the protection of walls and roofs. It’s not that I mind sharing, but there have to be limits. My house is built around a patio which has a central open area surrounded by a roofed shaded part supported by columns. These shaded and protected areas are ideal habitat for nesting swallows. But when you get to four pairs of swallows producing up to forty eight offspring in a summer season, that is an awful lot of bird poo landing on your cushions, walls and floor each morning when they wake up and then each evening when they come back to roost. The Jackson Pollack look is, I feel, a little modern for an old Arab style house. Then the young play dare swooping in and out of the doorways until the dimmest gets stuck inside and can’t find his way out. I have a two and a half storey tower in the centre of the house which beautifully draws the hot air up and out of its high windows and keeps the house cool without the need for air conditioning. It also traps lost baby swallows. Thankfully when young swallows sleep they sleep the sleep of the dead, so to remove them if they won’t fly low enough to go out of the doors that they came in through, you have to wait for them to go to sleep, usually perched on top of the bar of the wall hangings, and flick them into the swimming pool net before they know what is happening. The doorways are now sufficiently netted to stop the birds getting in. Apart from the usual bugs that crawl in there are a variety of fliers. We have long legged red wasps that like to find a nook in which to make little tubes of mud into each of which they lay an egg from which will eventually hatch a new wasp, but leaving behind the clay which is making the sound from you speaker more than muffled. 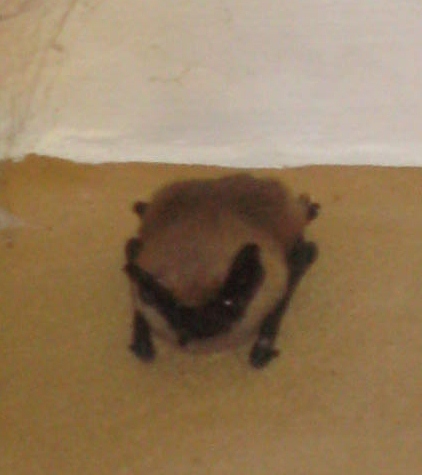 Bats are amongst the least troublesome guests. They just quietly roost on the patio walls. They do poo, but it is dry and like a small pellet of crushed insects, understandably, as that is what they eat. Easy to sweep up. Geckos are other welcome guests who earn their place in the house by eating any insects that pass them by while they are skulking on the walls and ceilings at night. They come in a variety of hues and patterns so are very decorative too. This spring I had a few hundred bees move in. I first noticed some scout bees doing their informative dance on one of the beams in the patio. I rushed off to consult the internet about what this might mean and was informed that honey bees scout for new sites for the swarm each spring and several sites are usually considered, most being rejected. So I didn’t worry, my site being, in my opinion, unsuitable. Some days later my neighbour and I were having a coffee in the kitchen when we heard a loud buzzing noise coming from the patio. The air was black with bees. Within ten minutes it was quiet again and not a bee was in sight. I breathed a sigh of relief – my patio I assumed had been rejected. Not a bit of it, on the other side of the patio, where I had seen the scout bees, the whole swarm had settled and looked as though they were planning to stay. I was just about to go on a trip for ten days, so nothing could be done immediately. When I returned the bees looked neater and organised into a rugby ball shape. I like bees, but I foresaw in the heat of the summer honey dripping down from the swarm and making a mess on the floor, which was bound to be a magnet for ants. 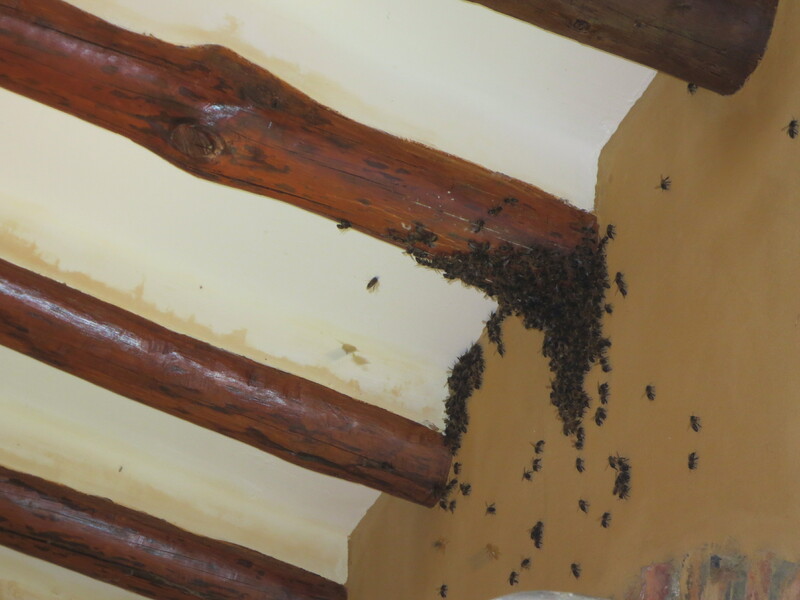 Plus all that bee activity only a metre or so from the summer dining table was a little too close for comfort. So they had to be relocated. I asked around my friends and Antonio was recommended as the man for the job. 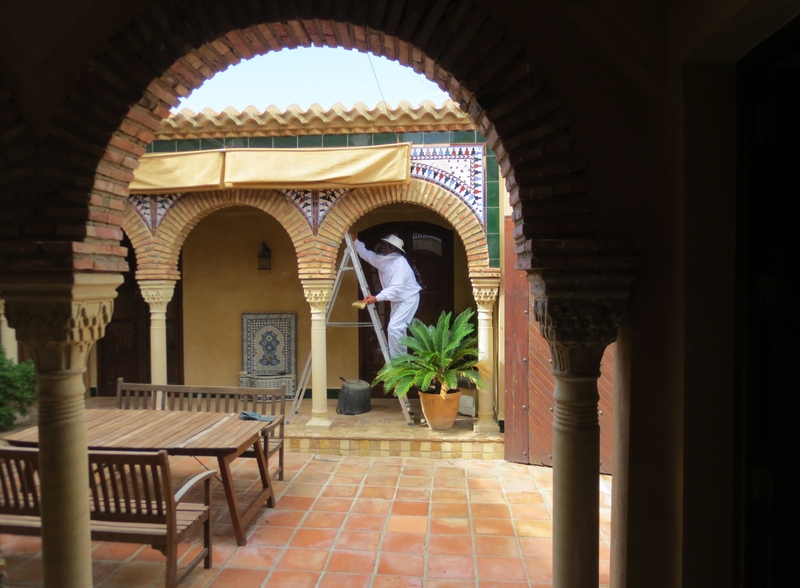 He came and gave my bees a look over, and then returned the next day with a hive and his full white suit of overalls and a netted hat. Antonio carefully moved the swarm into the hive while I watched from a safe distance. Only later did I read that moving a queen was one of the most dangerous jobs for a beekeeper. 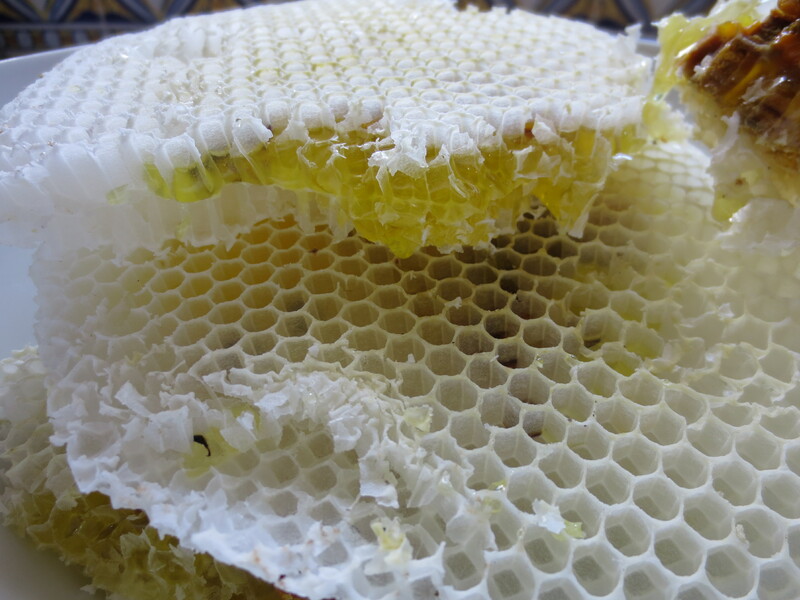 In the ten days or so that the bees had been in the patio they had constructed three round honeycombs about fifteen centimetres in diameter, and had already got quite an amount of honey stored in them as well as some embryo bees. I was quite surprised and impressed at how much work they had done in such a short space of time. 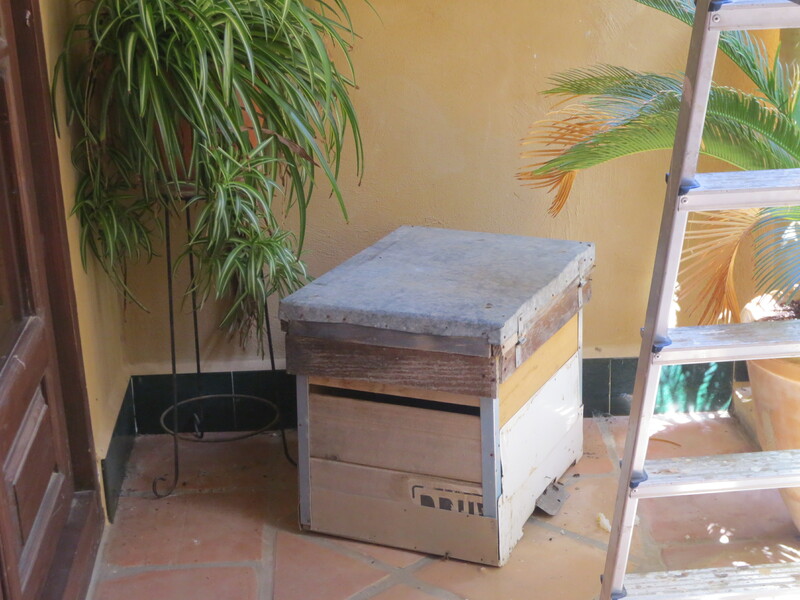 Antonio advised that we leave the bees for two or three days to settle in when he would return in the evening once all the worker bees were back in the hive and take them to a new home. 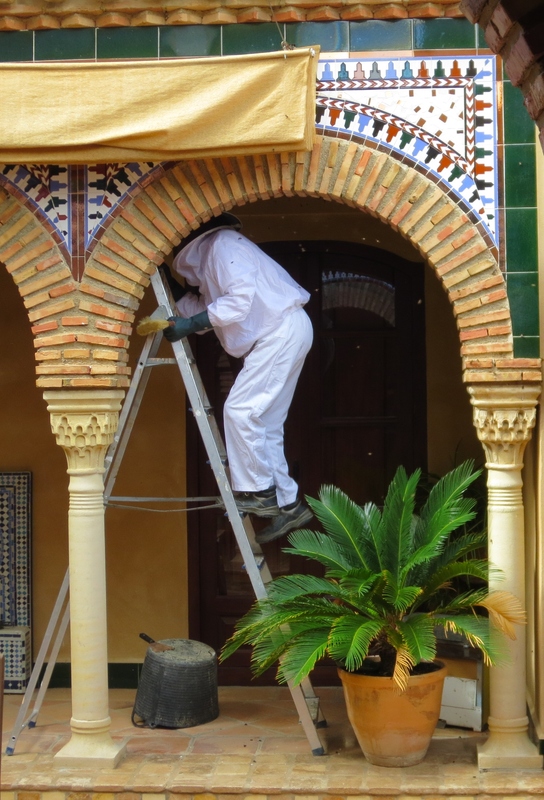 He enquired if I wanted to keep the bees and put the hive somewhere further away from the house, and I did consider the idea. But bees are precious and important creatures, and I have no knowledge or experience of beekeeping and wasn’t sure that would be able to look after them well enough. The honey though, was delicious. 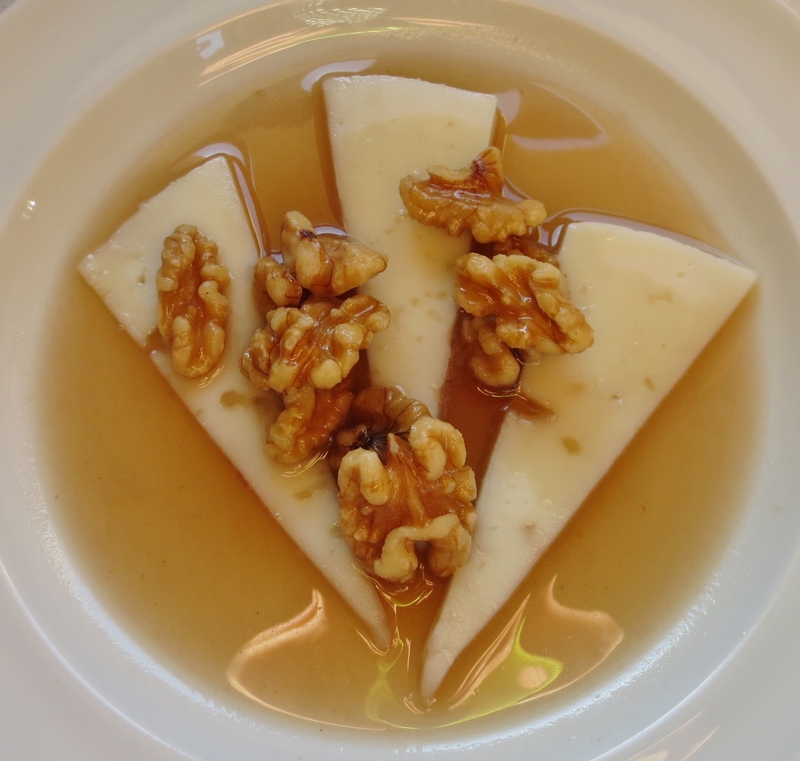 Here is a very simple northern Spanish dessert using honey. It is exactly my sort of dessert, mixing salt and savoury with sweet and nutty. A mild immature sheeps cheese works best for this. Slice the cheese and lay it out attractively on individual plates. In a small pan warm the honey with enough water to have it pourable. When it is hot add the walnuts and heat them through for 30 seconds. Don’t leave the walnuts too long or they will darken the colour of the honey. Spoon over the cheese and serve.